Lets be clear before we start, this is not a technical review, I’m not going to be spending ages telling you about battery life, settings and sport configurations, no. I’m going to tell you if I love the Suunto Ambit 2 and more importantly how much I love it based on my experiences with it. I will add that this is a product I paid for with real money and was not supplied for a review. The first thing to note is that I wanted to try it out across a few runs and cycles before I even considered trying to judge it – this had a lot to live up to as I’d really enjoyed my old Garmin Forerunner 410, but it’s usefulness was coming to an end. The Suunto was the intended replacement – could it fill the void? I had been umming about a purchase for several weeks, generally considering that nearly £400 was too much for any single piece of running kit, but I was also looking seriously at the Garmin 910xt which has had some generally excellent reviews. The big difference was the navigational ability of the Ambit2, a key element that made it stand out against the Garmin 910xt. So just before Christmas I placed my order with Wiggle who offered me the excellent price of just £270 (I already had a heart rate monitor, so this was solely the watch). I ordered in black because this as very much going to be a daily watch too and I wanted it to be as ‘everyday’ as it could be. Wiggle delivered as promised the day after Boxing Day and within seconds I had the box open, the watch strapped on and I was looking for my bike to go and test it out. Before we get to the first test let me describe the visuals, thickness and general comfort. The first thing is that this is a big watch, I’m not a big chap so perhaps it looks a little out of place on me and with the added thickness of the device itself you can tell you are wearing it in a day to day scenario. It doesn’t fit so well under a shirt cuff but looks the business at the end of your arm when you’re wearing a T-shirt or some hiking kit. As for the fit and comfort, well it’s more than comfortable enough, the rubberised nature of the strap makes it feel pleasant next to the skin but for me the fit is a bit awkward. I come between two sizes on the strap so it’s either just a tiny bit too tight or a tiny bit too loose – ultimately this is a problem I have with any watch and the Suunto is no different, but saying this the strap aims to accommodate all wrist sizes and the triple hole system employed across the strap means you feel it is very breathable. As mentioned the watch is pretty thick and with that comes the height from your wrist, what I found having used it for nearly a month now is that this isn’t so much of a problem and the height means that the buttons are never interacted with accidentally as they sit high enough away from your wrists to cause a problem. 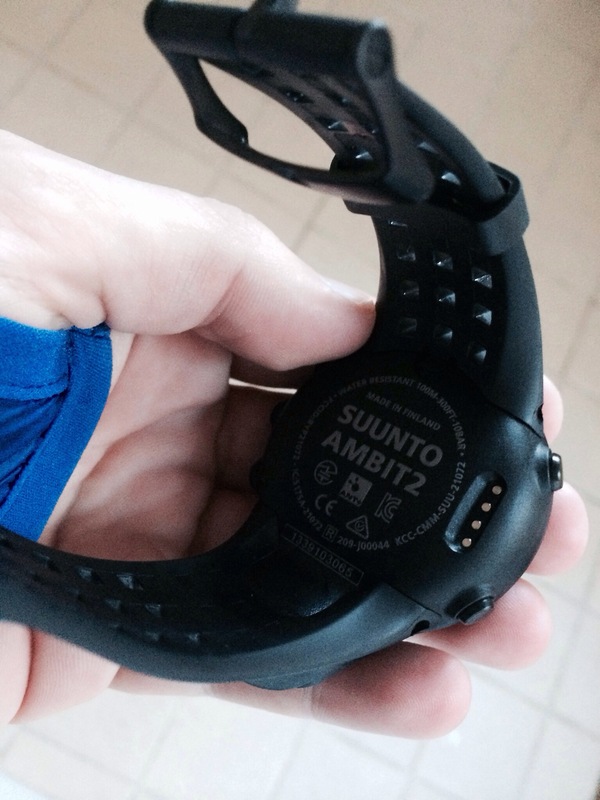 In this sense the Suunto has been well thought through, it is very suitable for both cycling and running where wrist positions are very different. In weight terms the Suunto is heavier than my Forerunner 410 but within the same range as other multi sport watches. Visually the Ambit is striking, the simple mono screen is highlighted by the beautiful black outer edging which serves as the bevel to protect the screen. Five nicely chunky buttons are found around the face of the screen, all clearly labelled nod it all airs on the side of understated. Only the little red triangle in the Suunto logo hints at anything special. 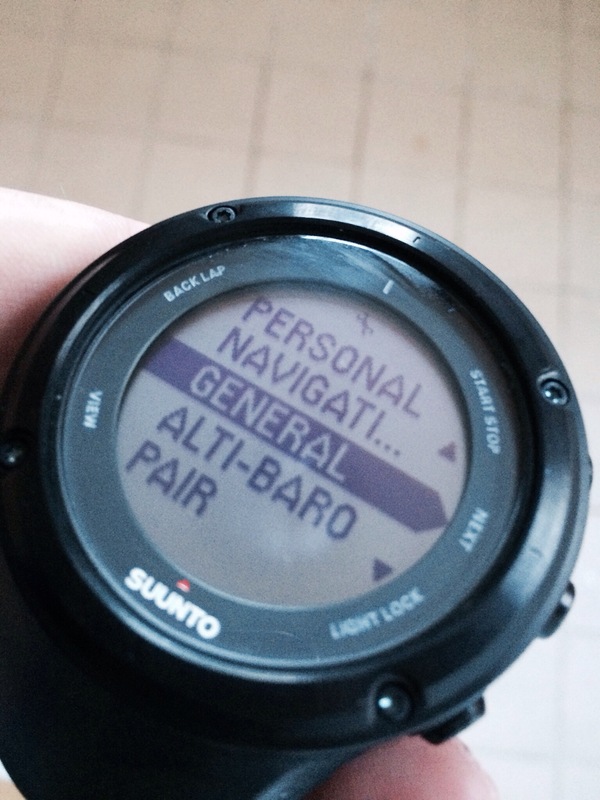 Again Suunto have got the visuals really right for this high end GPS product. Back to the bike! I’d saddled up, given the watch a half hour charge and set it up quickly and set off almost immediately. The Suunto had about a 5 second pick up time for the GPS – this meant no waiting around – my old Forerunner 410 even at the best of times was slower than this. I selected cycling from the preloaded sporting activities and then i hit start and away we went. On my first test there were no waypoints set up, no laps set up, I was just using it as a tracking device from point to point and back again. I cruised up and down the hills of Kent quite happily, forgetting completely about the watch as it silently did it’s job. On the bike the watch was comfortable and secure and I never felt it but I also never heard it – for me this was a bonus as I can become obsessed by the beep of a watch as it tells you which mile marker you’ve just passed. Upon completion of my cycle I hurled the iron horse to one side and kicked off my run, deciding I would do these as separate events rather than try the transition modes of the watch. Again the GPS was accurate, fast and kept an accurate record of my route – just what I was expecting. In comfort terms the watch again proved itself a winner and in its capacity as my primary running watch I found this comfortable and barely noticed it on my wrist. At home I hooked up the watch via the USB and waited for the upload – this took a couple of minutes – just enough time for a recovery cup of tea. The good news was that the data I uploaded was extensive, full of little hits of fun for me to pore over, although the one that was missing was the calorie counter – I assumed this was because I didn’t have a heart rate monitor attached – but speed, pace, ascent, decent, flat, route, etc was all there. Excitingly MovesCount also felt like a better, if less used, online system than say Garmin Connect or Fetcheveryone (and I’m a big fan of broth of those systems), but the community is smaller than the one offered by Garmin and more diverse as the range of sports covered by the Suunto watches is greater. That being said the community is ever expanding and I’m looking forward to developing this element of my MovesCount experience. So the first test had been a success and several more followed, I uploaded routes to the watch, added apps for sports that I like to do. I kept on adding hours to my new MovesCount account. The Suunto was earning it’s keep, but it had been bought with one thing in mind, keeping me on the right track during an ultra. I made a route in MovesCount that led me from my workplace to the train station, about 3 miles – a decent test distance – and through the tall buildings of London would offer the Suunto the challenge of staying on target. This was a walking challenge because it was about the technology and not the exercise (plus I’d buggered my leg) and so together we set out. I could see the pointer directing me along the little line indicating I was on the route and for the next three miles we wound our way down every back alley I could have found and never once did the Ambit 2 deviate from the route – I was impressed. I was impressed primarily because it looked like my gamble had paid off, I could load the Country to Capital file onto my watch and then simply follow it to the finish line, and that is exactly what I did – adding some waypoints along the route to make it easier. Country to Capital came and armed with my watch and loaded maps I felt confident that I wouldn’t go off path. At the start I clicked in for the GPS, chose my map and asked it to navigate, no drama. Country to Capital was made much easier knowing that navigation was being taken out of my hands, the additional waypoints also allowed me to be notified that I was still on course at regular intervals and this became something useful to hear as it meant another milestone had been met. Crossing the line at C2C was a very happy moment and despite loving my watch I was very happy to switch it off. I’ve read that the battery life can last up to 50hrs with the GPS locking on every 60seconds and in 1second mode it is more like 20hrs. However, I managed to burn through the bulk of the battery in a little over 10hrs but that was using the GPS constantly for both tracking and mapping. On a 100mile route I would probably need to carry with my a battery pack to give it charge as I ran. However, I really can’t complain, the battery life, given what it is doing is exceptional and you’ll be impressed with it on your own adventures. 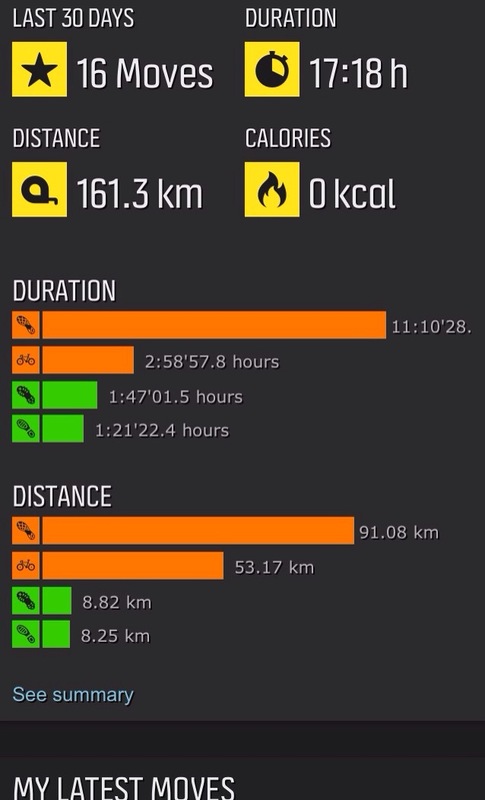 The routes in comparison to my Forerunner are slightly better, but it’s very minor, the accuracy in both devices can’t really be faulted but the Suunto wins out in that it is measuring your height as well as ascent and descent. There is something just more complete about the Suunto Ambit 2 in the way it gives you data and the way it displays it. I’m a big fan, as a designer I can see that some thought went into the user interface, it feels intuitive without being overly designed, it is bold and striking, something that Garmin Connect could never be accused of but doesn’t feel childish like Nike+ does/did (it’s been a while since i last used it). The synchronisation between watch and software is excellent and while it’s not the quickest it’s certainly far from the slowest. Some people will complain that there is no Bluetooth as standard but if I’m honest I prefer the USB upload – I used to wait an age for my 410 to connect via ANT+. I’ve used this for hiking, walking, running, ultra marathoning and cycling so far but have yet to really put it to the test in open water or the pool or one of the many other sports it supposedly tracks. 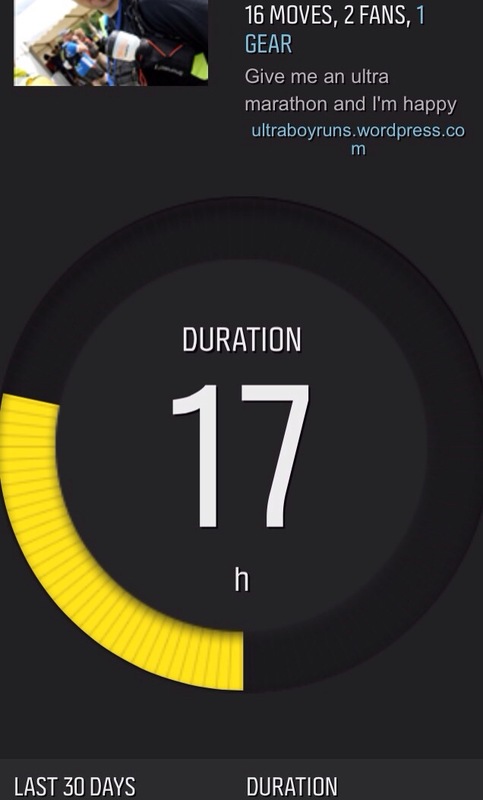 The multi sport combined with the ability to create your own apps makes this pretty unique for measuring exactly how you do sport. I can say that in each of the activities I have tried it I have been very impressed but it’s a pretty limited pool of activity. I will be writing about my experiences in the water though over the next few weeks. I’m not even going to go into its capacity as a Triathlon watch as this is something I’ll be exploring in greater depth as the year rolls on and much like a swim review, I’ll be generating a Tri review too. I have been accused by more than person of loving the kit more than the running – that’s not true, but I do love new kit and especially new kit that really helps. The Suunto Ambit 2 is a piece of kit that really gets what I need, certainly in terms of running and hiking – the rest is awaiting testing. It’s expensive but then if you want a feature rich, simple to use, dynamic and well built piece of kit then this is for you. It doesn’t have the bells and whistles in terms of colour screen that the new generation of Garmin does but I think they would be a distraction here. There are flaws but they are pretty tiny, a strap that doesn’t perfectly fit my wrist and a GPS that doesn’t have an endless battery supply – hardly crimes of the century. I’d love to see how they could improve this watch, perhaps an even more ergonomic shape and they might find a new home for the GPS sensor (currently it’s housed on the edge of the strap), they may even find a way of adding cutesy graphics to make it more appealing to the visually needy generation, but who cares? 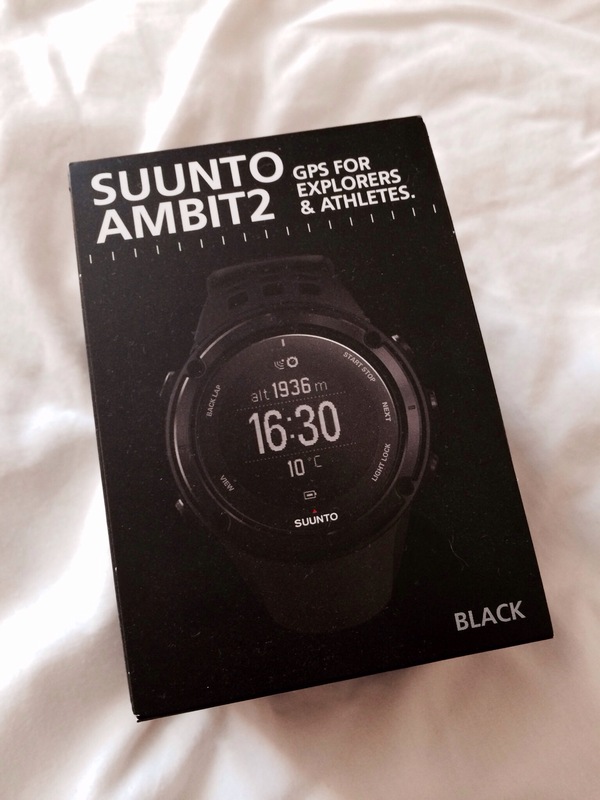 The Suunto Ambit 2 is an amazing watch and if you are thinking of upgrading this could be the device for you. 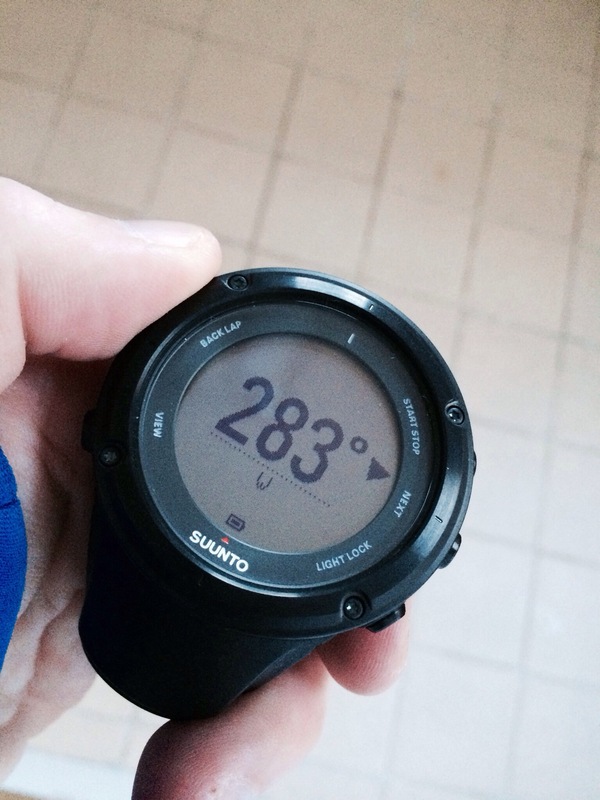 I would point you in the direction of the DC Rainmaker review website, here you will find a great deal of depth over exactly how much the watch weighs and what it does and also the Suunto website where you can get a full run down of specifications. Have fun runners. How on earth did you get that for £270? What a bargain! A real bargain but I will say that it’s worth every penny of the £370 it normally retails for (with HR monitor) or £330 without. 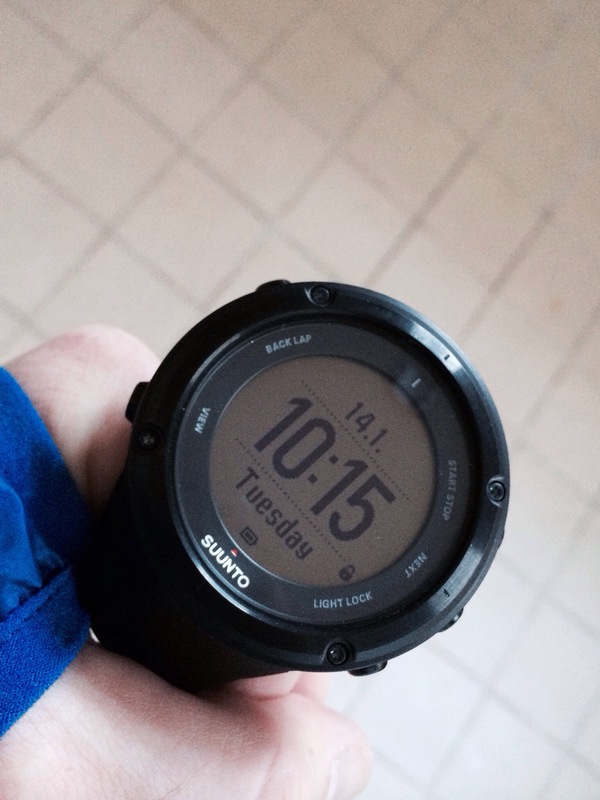 I love the Suunto Ambit 2, and I’m still only just discovering what it can do!